I couldn't help but notice all of the cute Easter recipes on Pinterest lately! I am always skeptical of Pinterest cutesy stuff- but these two seemed easy enough, so I gave them a try this weekend. They both turned out great and were quick and inexpensive. As Easter is quickly approaching, these yummy breakfast treats are a great way to reiterate the true meaning of the holiday one morning this week with your kids. All you need is one bag of large marshmallows, one package of crescent rolls, melted butter, and equal parts cinnamon/sugar. Make sure the melted butter has cooled and dunk it in! Then roll the marshmallow in the cinnamon sugar mixture. The marshmallow represents Jesus and the butter/cinnamon/sugar represent the oil and spices they prepared Jesus' body with after his death. Wrap the crescent rolls around the marshmallow completely. The crescent roll represents the cloth they wrapped Jesus in for burial. Place the rolls in the oven for 350 degrees for 9-11 minutes - the oven represents the tomb Jesus was placed in. Once they are finished baking, cut the roll open and you will see the marshmallow has completely disappeared - just as Jesus did after 3 days. Make sure you seal the crescent roll all the way around or you'll have marshmallow fluff everywhere! I don't quite think exploding Jesus is the message you want to send! I hope to make these with my sweet nieces this weekend! They are easy to make, give an opportunity for a Bible lesson and are legitimately really tasty!! These yummy snacks are your average rice krispy treats, kicked up a notch with food coloring for the Easter season! 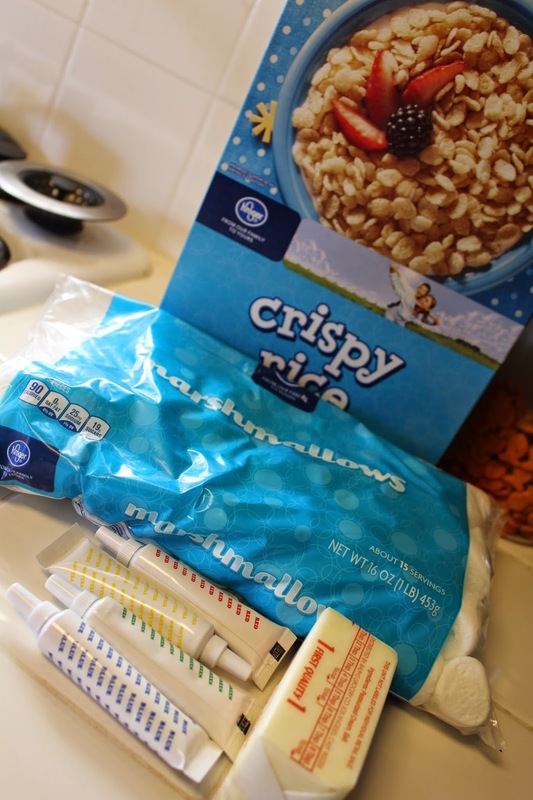 All you need is a box of rice krispies (or "crispy rice" if you're cheap like me and get the store brand), one bag of large marshmallows, 1/2 stick of butter, and the basic food coloring pack. Divide your 1/2 stick of butter into thirds for each of the colors. Begin melting the butter and put in a third of your marshmallows. Add in a few drops of red food coloring to achieve the pastel pink. Stir in a third of your rice krispies and press into the bottom of your glass casserole dish. Make sure to spray with Pam beforehand! Continue these steps with each color - using a different pot for each color. To make the lime green I used mostly green with a few drops of yellow. Lastly, I did a purple layer made by mixing equal parts red and blue. I did not let the layers sit for long so they would mold together and not pull apart. Let the treats cool for awhile and they are ready to eat! I tried to measure out equal parts for each color, but with this kind of recipe you don't have to be perfect! Currently, trying to pawn these off on co-workers so I can fit into my Easter dress..